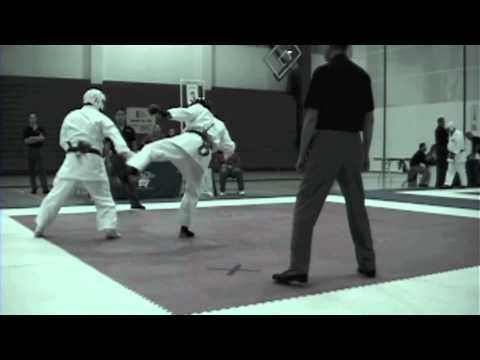 Fight Highlights From Illinois Shotokan Karate Club Tournament 2010. It’s good to test yourself every once in a while. Do a personal gut check to see if you have the heart to stand up and put what you practice into action. It’s not about wining or losing it’s about putting yourself out there. Testing your steel and coming back with experience. Karate has always been a part of my life it has given me focus and discipline. The psychological aspects I apply to many parts of my life. I use the same mentality when I get my self out of bed at five a.m. to workout. Clearing your mind and pushing yourself out of you comfort zone will take you farther than you could ever expected. It was a good day for me at this tournament. I won first place for kumite (fighting). The sportsmanship and respect was present in every participant. I truly learn a lot about myself and what I need to keep working on. Remember the biggest room is in the world, is the room of self improvement. Click here to find out more about ISKC.